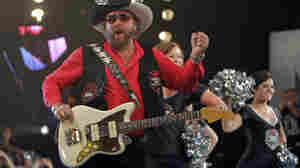 Hank Williams Jr., here seen promoting Monday Night Football, will not be part of tonight's broadcast after he made comments comparing President Obama to Hitler. October 3, 2011  ESPN says it won't use Hank Williams Jr. in tonight's Monday Night Footballprogram, after the singer compared President Obama to Adolph Hitler earlier today. Williams made the remark on Fox News, while talking about Obama playing golf with Speaker John Boehner.